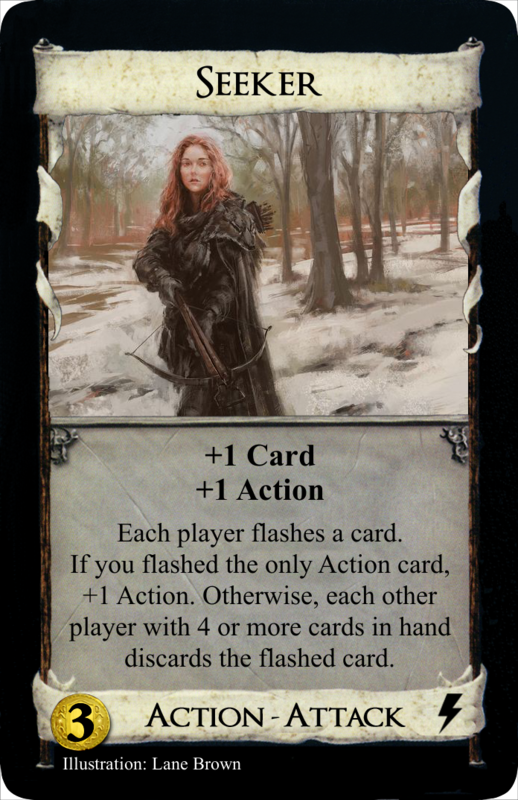 A while ago, I have come up with a new concept for non-attack player interaction on Dominion cards. (In Contrast, most of these cards turned out to be attacks.) I finally got down to make some images to have them ready for playtesting. Beware though, as all of these cards are completely untested as of when this was posted. Enjoy and please leave a comment! Flash cards cards are recommended for games with 3 or more players. Several of them use the term “to flash a card”, meaning to put a card from one’s hand on the table face down and, when all players requested to do this have done so, simultaneously reveal it and put it back into one’s own hand, unless otherwise instructed. +1 Action. +$1. Each other player flashes a card. Gain a card with cost exactly equal to that of a card with the highest cost in $ revealed. Each other player gains a card costing the same as the card with the lowest cost in $ (or tied for lowest) revealed. +1 Card. +1 Action. Each player flashes a card. If you flashed the only Action card, +1 Action. Otherwise, each other player with 4 or more cards in hand discards the flashed card. +$2. Each player flashes a card. 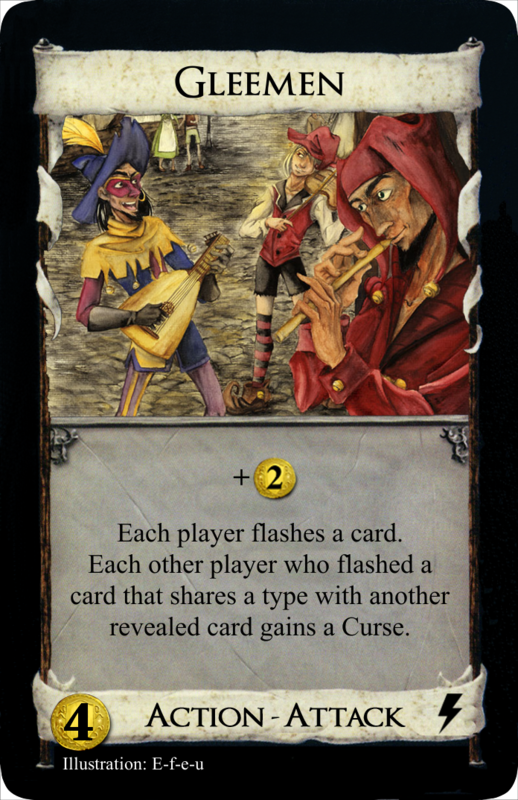 Each other player who flashed a card that shares a type with another revealed card gains a Curse. Each other player flashes a card and trashes it if it’s a Copper. If any Copper was trashed, gain an Action card costing up to $5. 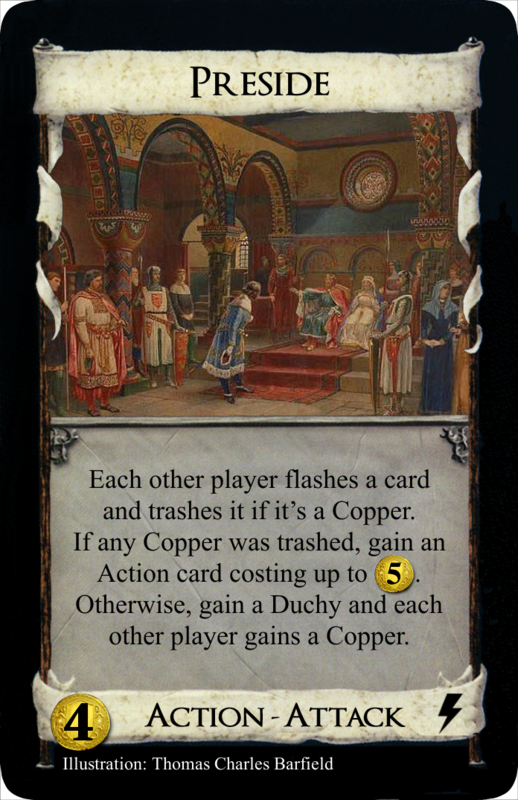 Otherwise, gain a Duchy and each other player gains a Copper. Each other player flashes a card while you flash a card per other player. If the total cost of your cards is higher than the total cost of the other players’ cards, +3 Cards and +1 Action. Otherwise, +$3 and +1 Buy. Older versions are listed below for reference. +1 Action. Each player flashes a card and gains a non-Victory card with cost exactly equal to that of a card with the lowest cost in $ revealed. +$2. Each player flashes a card. Each other player who flashed a card that doesn’t share a type with another revealed card gains a Curse. Each other player flashes a card while you flash 1 card for each other player. If the total cost of your cards is higher than the total cost of the other players’ cards, +$3 and +1 Buy. Otherwise, +3 Cards and +1 Action. +4 Cards. Each player (including you) with 5 or more cards in hand flashes 2 cards. If the total cost of their revealed cards is $5 or more, they discard one of them. Otherwise, they discard both. 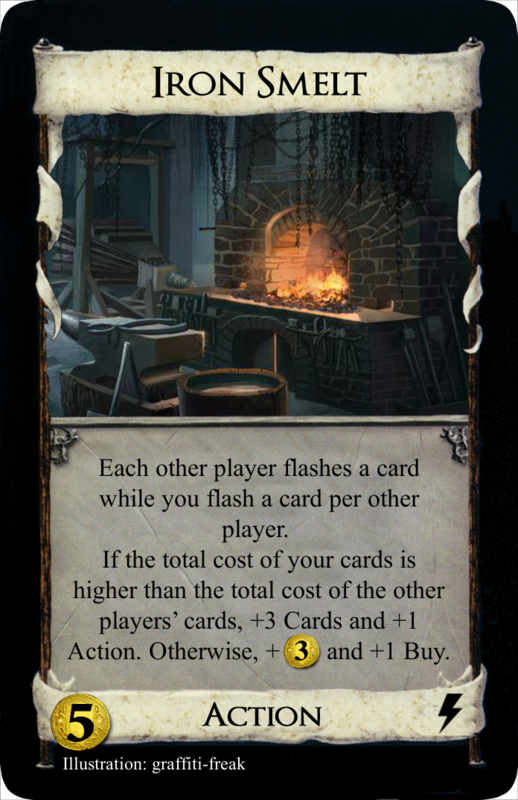 I see that flashing on your cards means basically "revealing without knowing what the other players revealed", which isn't a concept we have in Dominion, yet. Obviously it creates situations where you are, let's say, the only opponent to reveal an action card Seeker, and are the only one who has to discard something valuable. I'm not sure i like that specific card, and i'm not sure Cardinal needs the cards to be flashed instead of simply revealing them, but it works nicely on Gleemen, Preside and Iron Smelt. I'd consider unsing another expression over "flash", though, as the word already exists and means "to reveal for a very short time". About the individual cards: I think Preside and Iron Smelt are nice, and that Gleemen has an interesting idea that i'm not sure works as it is right now. As players can avoid getting hit as soon as there's a convention of "let's always reveal Copper if available", and there are only 3 basic types, i think it's going to be a dud very often. How about giving out Curses if you flash a card with the same cost as another player? Also, Blueprint is a non-attack Copper junker for $2 as long as you have Copper yourself (which you will, because everyone will go for it). Is it supposed to say "each other player"? And "exactly equal" is the same as "equal". Iron Smelt looks too good, but other players can make you "win" to steal your actions away and give you the (worse) coin outcome. I think i like Preside the most here, although i have absolutely no idea how to play it right. When I came up with Blueprint it cost $4 but today I thought it's just a weak card. Either you are Copper-junking (including yourself) or everyone gets a card of their choice - both pretty weak options. I'm not even sure it's ever an attractive card to buy. Iron Smelt originally cost $6 but when other players actively influence the outcome, especially if it's terminal or not, it has to come with a severe discount, doesn't it? I would like to try it cheaper first so people actually go for it. You are right about Cardinal. I was just thinking about its balance but forgot to make the fact that it makes people flash cards actually relevant. Oh, i missed the fact that Blueprint gives yourself a copy of the card. I assumed it would be other players revealing for them to gain a card, but that doesn't make much sense, does it? Yes, it doesn't give any benefit to your that your opponents don't get, and even costs you a card in hand. How about making it a Woodcutter instead of the +1 Action (still for $2)? After all, it's not strictly better than Woodcutter, and one can even consider the gain for other players a downside. However, i'd think about letting only other players flash (with you still gaining) and not giving out any cards if the lowest was $0. I like Seeker a lot because it is a conditional Village with a bonus. No Vilalge variant exists at 3$ and it is not easy at all to come up with something like that. Great work! Gleeman implies a nice little guessing/bluffing/rocks-papers-scissors game. Not the only one among these cards but here this minigame is most pronounced. Preside is hard to evaluate. Unless there are decent other trashers I guess that I rather wanna get rid of a Copper than gain another Copper in order to prevent my opponent from getting a 5$ Action. On the other hand early in the game you might rather want a Copper than a Duchy so Preside could backfore massively. I guess that is the sign of a great design. I think that Ironsmelt is too strong and should cost 6$. +3$ and +1 Buy are probably OK for a 5$ card whereas a double Lab is quite strong (hard to put a price tag on that and probably pointless as there are good reasons against an unconditional double Lab). You could argue though that the better option happens less often than 50% which would imply that a price of 5$ is OK. As you already played a 5$ card and as the other two players can pool their expensive cards together it is more likely for two players to have a Province or Gold to flash than for one player to have two. Unless the game is draw-intensive so that Iron Smelt is played while the active players has a lot of cards in his hand. About Cardinal, am I missing something or isn't this just more or less a Hunting Grounds? Sure, the attack is more likely to hit the active player but does this warrant a price decrease to 5$? Overall a great new mechanism. It is similar to (but more general, flexible and better than) a rough idea I play around with: a Masquerade variant in which the cards are, to use your lingo, flashed before they are passed. Passing the most expensive card implies a bonus and passing the cheapest cards implies a punishment. About Cardinal, am I missing something or isn't this just a Hunting Grounds with a little attack on top? As I write this post, I keep changing my mind about whether I like Seeker. Outside of ruins games (or maybe terminal collision), it seems rare that anyone besides the Seeker-player would flash an action card to Seeker. It seems okay. The idea with Iron Smelter is to flash your cheapest cards, so when everyone else flashes a copper, you have to have a pretty bad hand in order to activate the better effect (unless you have a madman, spoils, and/or prizes), but +$3, +1 buy a still a pretty good $5 cost card, and the unpredictability of it is probably balance enough. Preside is nice (although weird as an attack because more often it'll be a benefit to the other players). Usually a strong gainer with the drawback of letting other players trash a copper. I really like Cardinal (despite not needing the 'flash' mechanic), though it might need a minor nerf. +4 cards, discard one (as it will usually be) is still stronger than most smithy+ cards even if it didn't have an attack on it. EDIT: Then again, the attack is pretty weak, so it might be fine. Blueprint and Gleemen are the only ones here I don't like. Blueprint is a dud, and Gleemen doesn't look like it'd work well. After a couple plays (if not at first), everyone will flash a treasure. I will have to go back and read more of the cards carefully when I have a moment, but I wanted to chime in and say that I like the flash mechanic (though I agree it could have a better name). It's essentially simultaneous moves, which allow for interesting game theory ideas, like Prisoner's Dilemma and Chicken, to come to Dominion. I think the only official card like that is Masquerade. I think Iron Smelter would be more interesting if the weaker option made it easier for you to activate the strong one, while the strong one made it harder. The opposite is true right now, as the stronger option increases your handsize so you have more cards to choose from (while the weaker more or less decreases it). Maybe the stronger option could be more of a sifter (like "draw 3, discard 1", or "draw 4, discard 2"), so it would make you discard junk and make triggering more of them harder. Also, a 3-to-2 sifter would feel lees "strictly better" than Lab. 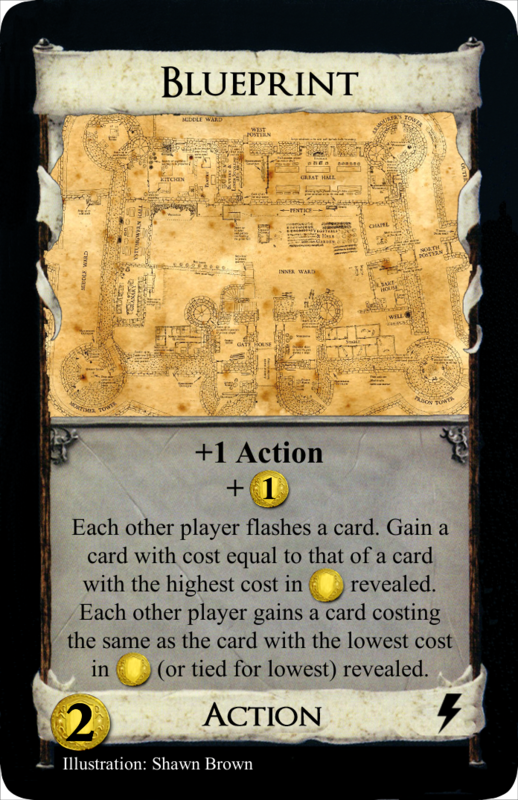 Blueprint is only very slightly better than Ruined Village, because presumably you are only going to play it in a situation where you think you'll get more benefit from the free card (or less harm from the free card) than your opponents. Either way though, it's extremely weak. I will soon go over all of the flash cards and rework most of them before they enter the first test phase. In conjunction, I could change the term 'to flash' to something more fitting. I have a few ideas - pop (up), pulse, flicker, sport, divulge, disclose, unveil - but since English isn't my native tongue, I would welcome any feedback and suggestions. This suggestion may be a downer, because it will make the cards seem less special and (wait for it) flashy - but how about "reveal at once"? Just use Masquerade's wording to express Masquerade's timing. Yes, maybe that's even clearer. I went with "at once" because it's on an official card, but i guess the extra clarity doesn't hurt. Either way, i think defining a new word isn't really necessary, considering how little space that extra word takes and how Dominion usually goes with self-explanatory standard language (the only exception i can think of is "call", which would take a lot more words to express in standard language). I have updated the OP. I considered your feedback and made a few changes. Blueprint now punishes other players for revealing low cost cards as then they have to gain bad cards, too. In that worst case Blueprint is a Copper for you which might still be too weak. On the other hand, if any other player reveals a card with a high cost to avoid gaining junk, you gain a better card, too. I'm just concerned that other players might work together to screw your Blueprints over but we'll see about that in test games. Gleemen now hands out Curses to players who revealed cards that do share a type with other revealed cards which should be more likely in the early game. It also makes it harder for your opponents to agree on a counter strategy. Gleemen might actually be too strong this way. Iron Smelt's two outcomes are now switched so that achieving the presumably better outcome (+3 Cards, +1 Action) is harder to do than before. With that change I feel safe to test it at $5. I left Seeker and Preside as they are for now but I am wary of Seeker possibly being too strong. Playtesting will show more. 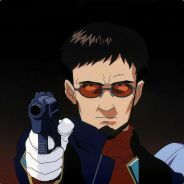 I'm not happy with Cardinal in its current form. It wasn't meant to be an attack. I wanted something with "flashing two cards" but haven't found a way to implement this in a reasonable way, yet. I'm sticking with the term "to flash" because the shortest phrase to replace it would be "to reveal from their hand at once" which is too many words for my taste. I like the slimness of a single-word term (which can still consist of a different word if applicable). Blueprint should be an attack, I think. I don't think it should because, similarly to Masquerade, Blueprint totally wouldn't work if every other player revealed a Moat. I think Blueprints would work fine even if some or all other players Moat out. What's the problem? I think this is one of those weird cases where people can argue back and forth whether it should be an attack or not. Sure, it hurts them, but it can help, too. Both sides have a point. It's like that hypothetical "Each other player gains a Copper in hand", and a lot of other ideas. My solution for that is that i don't make such cards. If you must, i would say that if the attack type isn't applicable, you should leave it out. There are plenty of actual "attacks" that don't have the type. But why is that a problem? Sometimes Menagerie doesn't draw 3 cards. Sometimes Pearl Diver puts the same card back over and over again. Sometimes Saboteur gets blocked by Moat. What's the issue with Blueprints sometimes being nothing more than a Copper? This card is very interesting, because it is an implementation of the prisoner's dilemma. If no other player flashes an Action card, this works as a village, but if you don't flash an Action card or if you flash an Action card and at least one other player flashes an Action card (e. g. when this card would be dead in every case or if the player already has 3 or less cards in this hand) it works similar to Urchin. I like it. Blueprint should be an attack because it makes them gain cards.